Russian-Iranian bilateral ties are strengthening. Russia is feeling the heat from NATO powers, which insist on installing missiles in Poland and an air defense radar system in central Europe. No matter what falsehoods and blather you hear from officialdom in Brussels, this renders Russia a potential target for a first strike. So naturally, the Russians wish to counterbalance this threat by propping up their enemy's enemy: Iran. The Iranians, for their part, whether you like the outlandish-provocative ramblings of the so-called "Islamo fascists" or not, are surrounded—thanks in large part to the reckless "Great Satan"—by increasing instability. Ironically, Iran is an island of calm in the middle of a raging tempest. Iran's biggest neighbors are tinderboxes about to explode. The Persian state is effectively bordered by four war zones. The first includes Turkey, as Ankara appears to have been drawn into a "mini guerrilla war" with the Kurds on its southeastern border. The other three—in Iraq, Afghanistan, and now Pakistan—are all bloody messes, to say the least. Iraq has begun to decompose and is headed for partition along sectarian-religious lines. Afghanistan risks "rollback" in the form of a Taliban revival and a return to power of the mullahs and imams. Moreover, nuclear bomb-equipped and civil war prone Pakistan is on the verge of an Islamist takeover, which could make the 1979 Iranian revolution look like a kindergarten tea party by comparison. Baghdad, Islamabad, and Kabul— a "troika from hell"—are essentially failed states kept afloat only by billions (trillions?) of American aid dollars. But for how long? In view of the pandemonium in Pakistan, Democratic Party presidential candidate Bill Richardson has hinted on the campaign trail that cash could be cut off to the United States-backed puppet President Pervez Musharraf. As Tehran witnesses the disintegration of yet another bordering state, it seeks a partnership with the only counterweight to American dominance—or misplaced idealism if you prefer—in the Caspian Sea-Persian Gulf region: Vladimir Putin's Russia. Realpolitik Russian-Style or a Courtship of Connivance? According to an official communiqué issued by the Iranian state news agency IRNA, Russian Deputy Foreign Minister Alexander Losyukov said on Thursday that Iran has a "special" position in Russia's foreign policy. Regardless of this apparent rapprochement, Russia has denied or refuted this week recent news reports about the purported arms deal between the two countries. The delivery was supposed to be part of an antiaircraft S-300 missile system, which would likely deter any envisaged air attack on Iranian territory. Just the public mention of this deal, which was most likely deliberately leaked by Tehran (perhaps against Moscow's objections), sends a clear message to potential belligerents and enemies: "hit us and we'll hit you back." This revelation comes at a time when the Western powers are busy recalibrating their so far failed diplomatic strategy to curb Iran's nuclear ambition, and as the United States-led campaign to further squeeze Iran by means of sanctions is losing steam due to the recent disclosure about the flawed (or deliberately doctored?) Western intelligence on Iran. What is even more astonishing, aside form the purported missile deal, is the news of Russia's plan to deliver a second shipment of nuclear fuel to power Iran's civilian reactors. IRNA also noted, "On Iran's nuclear programs, he [Losyukov] said since the two countries enjoy very close ties, Moscow has played a special role to this end." How special? Well, almost crucial, as Moscow has apparently helped its Persian Gulf partner with its civil nuclear program since the 1990's, having even assisted with the building of the $840-million Bushehr nuclear reactor to which the fuel delivery is supposedly destined. Overall, Russia expects to earn about $10 billion developing Iran's nuclear industry by building more nuclear power plants. The Bushehr site, one of the largest in Iran, would most likely be a prime target in any air attack. Such concerns might explain Tehran's eagerness to purchase antiaircraft missiles from Moscow that would protect its nuclear plants from a bombing raid. Strategically speaking, however, there is little doubt whatever form closer defense-military ties take that the "mutual cooperation between Iran and Russia would help restore security to the region," as the IRNA statement that attributed the comment to the deputy Russian foreign minister emphasizes. Iran was one of Russia's preferred commercial partners in the Persian Gulf region and remains so to this day. Occasional friction was handled discreetly by means of a quid pro quo. For instance, despite Iran's outspoken support of its Islamic brothers in Lebanon and Palestine, Tehran kept silent during Moscow's ruthless military campaign to quash the Chechen-Muslim extremist uprisings. In the 1990's, Russia and Iran enjoyed "special" ties, to the dismay of the United States. 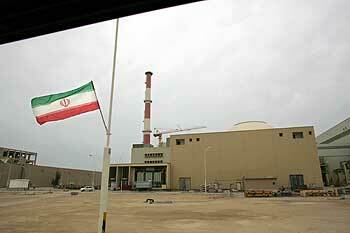 In 1995, Washington attempted to thwart nuclear, arms, and other highly sensitive technology transfers to Teheran. A shaky deal was made between Vice President Al Gore and Russian Prime Minister Viktor Chernomyrdin to halt such bilateral cooperation. In 2000, the undisclosed gentlemen's agreement was made public. Yet Washington continued to act as a spoiler, hoping in Moscow's view to get a piece of the arms sales action for its own defense industry. Over the years, Moscow has denied breaching any nonproliferation obligation in its arms and nuclear dealings with Iran. Victor Mizin, however, refers in his paper to reports in 1998 of clandestine missile technology transfers facilitated by the F.S.B. that at the time were denied by Russian officials. Yet these denials have been met with raised eyebrows in Western diplomatic and intelligence circles. In light of recent developments related to the reports of nuclear fuel and alleged missile shipments from Russia to Iran, these denials seem even less credible today.